Harvest Ministries was created by the Sr. High ministry to provide physical needs to the less fortunate while reaching deeper to touch them spiritually. The canned goods and donations are collected from the congregation and redistributed through our food pantry and are available upon request. During the fall harvest of gardens, many fresh vegetable items are distributed as well. We work with our Deacons to supply some of the needs of nourishment in our church and community. 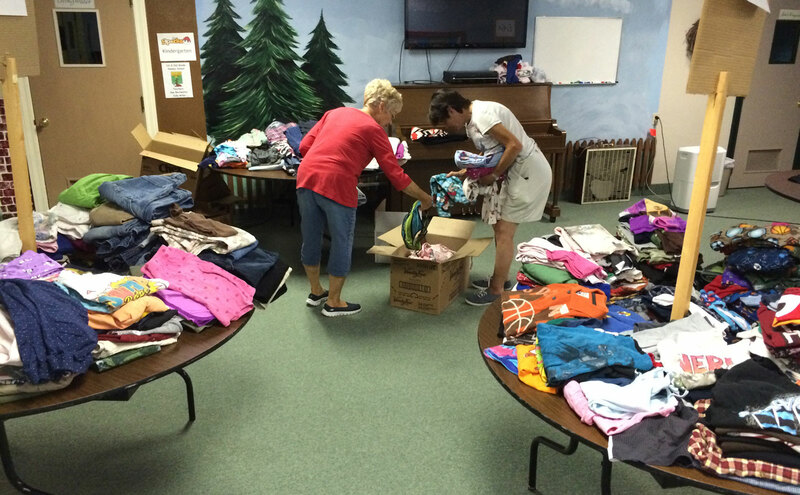 Each summer we also have a Clothing Giveaway (pictured below) to meet the needs of people in this area. Donations for the giveaway are received primarily in the weeks leading up to the event and hundreds of people are able to come on the Wednesday through Friday of the chosen week to take what they can use for their family. A group of dedicated volunteers prepare the racks and tables, sorting through many boxes and bags of clothes and shoes for all ages.